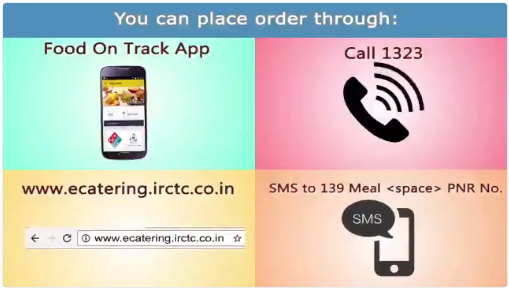 Booking of meals through IRCTC Catering - Food On Track App is now made simpler just by SWIPE and SELECT and ORDER. Install the newly launched IRCTC IOS app and book meal of your choice anywhere in India at your fingertips. Receive order detail and OTP on E mail and mobile. Auto cancellation of meal in case of PNR cancelled /fully waitlisted. Meal Booking with Cash on Delivery Option / Payment through Credit Card. Now order food from a restaurant of repute during your journey and get it delivered to your berth. log on to http://www.ecatering.irctc.co.in or call 1323, IRCTC android app and book meal of your choice anywhere in India at your fingertips.